It is helpful for our clients to understand our process before they begin the planning process. Each step of the way a Landscape Designer works with the client, evaluating the needs, providing solutions and designing the best options that work with the landscape within the client’s vision. The Landscape Designer also oversees the installation to assure everything is done optimally. 1. 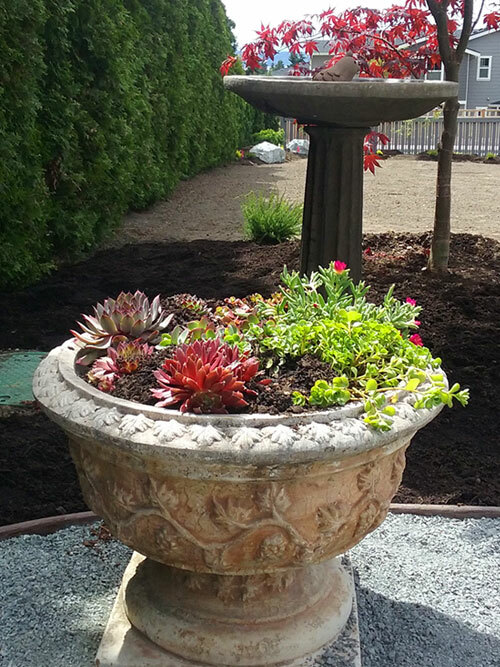 When the client sets up an appointment, they will meet directly with one of our professional landscape designers. During the initial consultation we present individual design options / discuss individual options based on the property and the tastes of the client. 2. Next, we agree on the basic plan. By listening to the clients’ expectations and tastes, the job becomes a collaboration, incorporating the likes and dislikes of the client. It is our goal for the project be a reflection of the client. Therefore, during the first appointment we present creative options based on personal preferences and agree on the initial design and style of the work. 3. The third step is to survey the site and present a preliminary plan. Once we have agreed on a general plan, our landscape designer and design crew determine the best options to reach the goal. They are presented with various cost options to achieve the best quality within individual budget goals. 4. Once the agreement is made for the client we present the client with a draft of the proposed landscape design. We use high quality illustrations of what the project will look like upon completion. The client can then determine if this fits their expectations. If any adjustments to the design are needed, they are done and when the client is in agreement, the final draft is drawn up. 5. The fifth step is presenting the contract to the client to be signed. Upon agreeing to the contract, the project team including landscape designers, construction and installation crew is coordinated based on the elements of the site and requirements of the plans. 6. The team begins the landscape preparations of the foundation, followed by structural construction (hardscape, walkways, cement and stone work, irrigation, etc) and finishes with plantings throughout the site. Our firm is qualified in all forms of landscape design and installation. Specializing in residential landscape design, we have the skills to make any area great. Our expertise enables us to give life to drab yards or create comfortable outdoor living spaces out of unused areas. Whether a complete overhaul of a property is needed or you are dealing with a small problem area, our licensed professionals provide excellent solutions including, but not limited to, creating inspiring gardens, custom patios and walkways and outdoor kitchens. 7. Upon completion, we do a walk-through with the client to ensure complete satisfaction. During this time, we discuss basic upkeep and maintenance instructions for vegetation, irrigation and lighting systems. If anything is less than the expectations of the client, we address that now and make the necessary adjustments. Optional follow-up and maintenance services are also available. With 26 years experience in the unique Snohomish area climate, we offer sustainable options considering its unique microclimate. With a working knowledge of which combination of plant species work, we use both native plant species and others that flourish year-round. Considering their specific needs, we install low-maintenance irrigation systems that work efficiently.